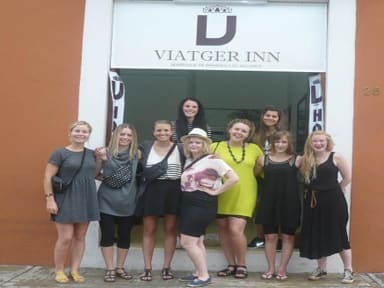 I LOVED this hostel and Campeche. The most aesthetically pleasing town I’ve ever been in. When I arrived the boy at the front desk was SO helpful and kind and we had a great conversation he even introduced me to a great volunteering organisation called ninth wave Mexico. I wish I remembered his name but I know he studies law. All and all great experience and loved the town. Bed room dorm was clean and the kitchen was clean. Please don’t hesitate in staying here. Very nice new rooms. You can use the kitchen area and hammocks to hang out. During our stay there were only two other people staying, so we didn't interact much with anyone. The location is perfect, you can reach many nice restaurants and the malecon walking. The hostel staff was the nicest people I have came across so far. So human and understanding. Keep it up!!!!! 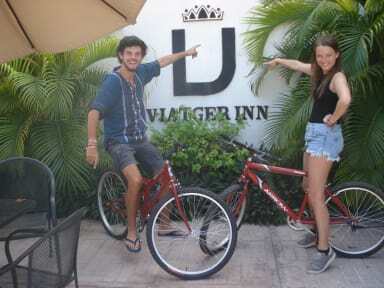 Staff were friendly and helpful - certainly the best of any hostel we've stayed in in Mexico so far. We stayed in an ensuite room which was lovely. Although it was a bit of a struggle striking the right balance with the aircon, between the room getting too cold or too hot. Complimentary shampoo and soap were supplied. Complimentary breakfast got the job done. All in all would recommend, great value for money. Staff was very accommodating friendly and helpful. Dorm rooms were well kept and bathrooms/ showers were clean and had hot water. I really enjoyed my stay at Viatger Inn. The staff were super helpful. The rooms were really clean and had all the facilities you needed - a reading light, plugs, lockers, good wifi. The AC in the rooms was dreamy. Breakfast wasn't amazing to be honest, but everything else was perfection. The staff were amazing! I can't praise them enough. One guy at the front desk was just amazing. We had a private room it was fine but the WiFi was a bit patchy there. Kitchen area was ok but the gas rings on the cooker was a bit iffy, very slow to cook, boil water. The air con and hot showers were fantastic!!! Location brilliant. Clean and good location. Helpful staff. Bathrooms kept clean and bins emptied regularly. Big spacious dorms however beds uncomfortable- could feel the metal springs! Charging point and light in each bed. Ceiling fan and ac to keep cool at night. Would recommend staying here however beds were not comfortable. Very clean! We were the only guests, so we felt a bit lonely. But all in all a good hostel with a nice kitchen- and chill-area!